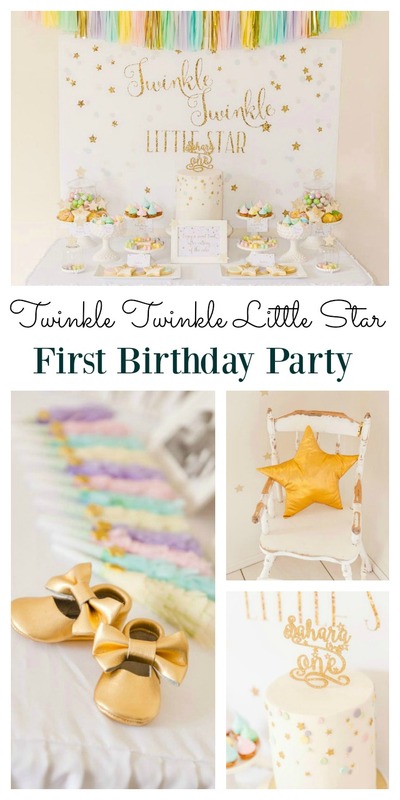 A twinkle twinkle little star party is perfect for a girls first birthday. This is one of those enchanting themes that your little girl will sparkle with. With ideas for party food and decoration, you don’t need to look any further to organize that perfect party. These desserts make you want to come back for more. Your daughter’s first birthday is rapidly approaching and whilst you don’t want to admit that she is turning one, you can’t actually slow down time. It would be nice if we could, but it’s just one of those things we have no control over. What you can control however is that super special first birthday that you have dreamed about since the moment she was born. It has to be something just as special as your daughter, but not something that you are going to stress about how you are going to achieve. Enter this twinkle twinkle little star party that has been submitted to us by Alex of Saffy & May. How many times have you sung this song to her and seen her face light up? Too many to count I’m guessing! Well this is the perfect party theme that you can look back on in years to come and it’s going to light up your heart every single time. We have all met ‘those’ mums, the ones that seem to have everything completely under control without even a hair out of place. They walk across the room like a breath of fresh air leaving you feeling….well….a bit like something that has been dragged through the bush backwards! Then comes the birthday party. You know that Every Single Little Detail is going to be perfect and you are left wondering how your home made sprinkles cake and fairy bread is going to even begin to compare. The reality however is that NO ONE is perfect and despite what you may see on the outside, ‘that’ mum could be freaking out just as much as you are! The truth is that she is also feeling inadequate and is also wanting to create a magical party for her beautiful princess and is wondering how on earth it can be possible. Don’t worry because you are not alone! The good news however is that this fear really can be fixed and you don’t have to be Martha Stewart to pull off the party you have been dreaming about since your daughter’s birth. Your dreams will certainly come true when you wish upon this star. This party is absolutely stunning with it’s pastel elements and gold flair, and with a little bit of know how, you can create it too! Alex said about the party planning: “I started planning for my little one’s first birthday pretty much after she was born. I didn’t have a set theme to start off but I knew I wanted lots of soft pastels and a touch of glitter gold. The KEY is really to be thinking simple. It may sound silly, but simple really IS the best. Sometimes all you need is the inspiration. You may not be able to coordinate the ideas in your head and that’s fine, but what you can do is take those ideas that have already been designed and run with it. The hard work has already been done for you! Take a good hard look at this stunning party. The tone is set magically with a white linen table cloth, some super cute white cake stands of varying heights and simple white plates. The entire tablescape is enchanting with a sweet paper garland as a backdrop and a table covered with mouth watering desserts including custard profiteroles, meringues, lemon mini tarts, mini cupcakes and chocolate little stars. The highlight of the table is the delightful cake with a gorgeous glitter gold topper. Party favors don’t need to be extravagant, and can also be used to add flair to the decoration. Alex said “In addition to the dessert table, we had a small favor table with party boxes for the guests, and some fringed party horns I made. I also displayed a selection of photos of Sahara’s first 12 months”. Whether you want to admit it or not, your daughter will turn one, so do yourself a favor and enjoy this special time. You may not be that ‘perfect’ mum, and you may have one or two hairs our of place, but do you think your daughter is going to care? Absolutely not! This first year is about you, it’s about your achievements. Congratulations, you made it – this is a BIG deal! This big achievement deserves a special celebration, for both you and your little girl. This twinkle twinkle little star party is one of those parties that you are going to remember for years to come, and it will certainly make your little girl sparkle. I would like to say a special thank you to Alex of Saffy & May for sharing this dreamy twinkle twinkle little star party with us. A cupcake shoppe party would be a super sweet theme for your little one. Is your little girl a princess? These princess party ideas might be just what you are looking for. 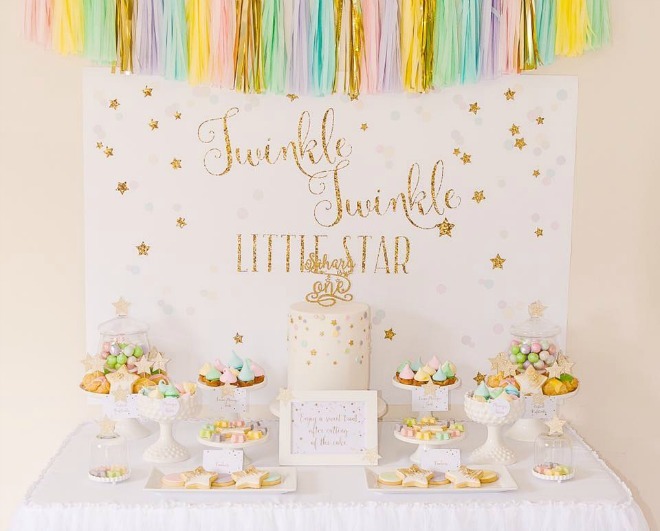 Hi, do you know where to get the backdrop panel that says Twinkle twinkle Little Star??? Please is gorgeous! Oh it is gorgeous isn’t it.